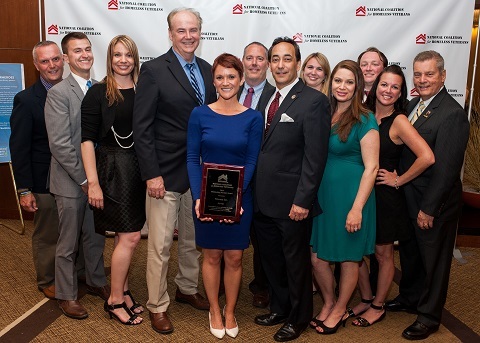 2015 NCHV Awards - Outstanding Member Award presented to Veterans Inc. Outstanding Member Award - Veterans Inc. The Outstanding Member Award goes to the NCHV member agency that has demonstrated the spirit of being a part of the National Coalition for Homeless Veterans – building collaboration to create change on the local level through applying national strategies and policies and sharing their path to success with others. This year we present the Outstanding Member Award to Veterans Inc. Like NCHV, the organization is marking 25 years of operations in 2015. They started off as a group of Vietnam veterans in Worcester, MA who recognized the rampant veteran homelessness plaguing central Massachusetts. Together they established the Central Massachusetts Shelter for Vietnam Veterans. After convincing the state to transfer ownership of an abandoned, dilapidated former national guard armory to them, this group set about fundraising, collecting donations in ammo cans and battle helmets outside of supermarkets and department stores. They eventually raised the funds to rehabilitate that structure, opening a nine bed shelter in 1991. Today, Veterans Inc. serves over 3,000 veterans and veteran family members every year. With capacity to shelter almost 300 veterans across six states, they also provide comprehensive employment services and facilitate access to mental health and substance use disorder treatment. Their program was also an early adopter of special accommodations to serve homeless female veterans.